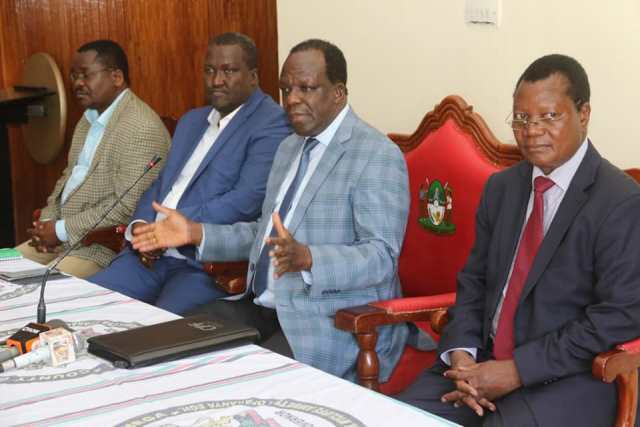 Governor Wycliffe Ambetsa Oparanya has hit out at the new fuel tax saying the government had many options on raising revenue without hurting the economy and ordinary citizens. The governor who was speaking at the County headquarters today during a press conference also addressed by the visiting CS for Petroleum and Mining, Hon. John Munyes called on the government to balance the budget by taxing the rich and their luxury items. He questioned why the taxation which had been earlier rejected by the National Assembly had been imposed to Kenyans by the Executive terming it impunity of the highest order. “The new constitution gives each arm of government specific roles that should never be usurped by the other,” he said. The Governor said the balooning debt crisis can be traced to failure by the national government to budget within the available resources. He warned that failure to cut back on runaway expenditure was denying counties their fair share of national resources which amounts to killing devolution saying the government has not matched its appetite for money with its revenue. H.E. the Governor said the people of Kakamega had waited for too long to enjoy the benefits of extracting minerals in high potential areas of Ikolomani (Rosterman). He announced a stakeholders meeting in Kakamega on 9th and 10th of October, 2018 to discuss the way forward for the industry. CS John Munyes said the new tax should be suspended to allow more discussions adding that the uptake of petroleum products had reduced drastically nationwide and appealed to the President to re-discuss the VAT. The CS who was accompanied by the Principal Secretary in the Ministry, Dr. Ibrahim Mohamed said the Mining Act will be operationalized soon to give impetus to mining activities in the country. He said Kakamega County had greater potential in mining than any other county in Kenya. Also present were H.E. the Deputy Governor, Prof. Philip Museve Kutima, the CECM for Water, Environment and Natural Resources, Mr. Baraza Wangwe, the Chief Officer Natural Resources, Environment and Climate Change, Mr. Stanslaus Palapala Muteshi, County Secretary, Madam Jacinta Aluoch Odhiambo and senior staff from both County and National governments.